One of my favorite things to order at one of the local Mexican restaurants is Chili Rellenos. I’ve found that not all Chili Rellenos are made equally though. Their tastes can vary greatly between restaurants. Some put meat in and some don’t. Some do different types of cheeses. 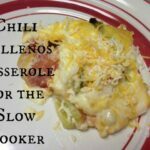 Typically I don’t try them just anywhere, but when I saw that I could try a version of Chili Rellenos in my slow cooker…I figured it was worth a shot! Now, this recipe isn’t exactly like my favorite Mexican restaurant’s taste, but it’s close…and close enough to make me happy. Here’s the recipe. Go to the end and there’s a video that shows exactly how I assembled it. Grease the inside of the slow cooker with butter. Pour can of tomatoes over the top. Mix together eggs, flour and milk in a bowl and pour over the top of everything. Cook on low for 5-6 hours or on high for 2-3 hours. Use Quart Sized bags and put the different kinds of cheeses in 2 separate bags. Next, mix together the eggs, flour and milk and pour into another quart sized freezer bag. Label all bags with “Chile Rellenos Casserole” and staple together the tops so they don’t get separated. On cooking day, make sure all ingredients are thawed before beginning assembly. Follow assembly & cooking instructions above. 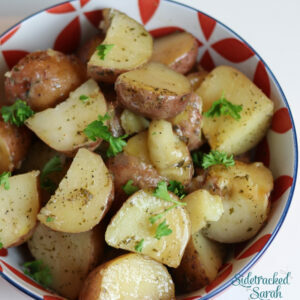 This recipe feeds up to 6 adults.